Octoplus FRP Tool Activation enables FRP (Google Factory Reset Protection) reset operations for Samsung, Huawei, LG, Alcatel, Motorola cell phones. SRF file could be taken from the device or read out from Full Flash file in binary format. This feature allows the user (without developer’s assistance) add devices to the list of supported models, which are not officially supported yet. The user will be allowed to upload that custom SRF file into a separate section of Support Zone for further analysis by developers. If custom SRF file would be recognized as a legitimate and correct, name (or nickname) of the author will be presented in the following update. 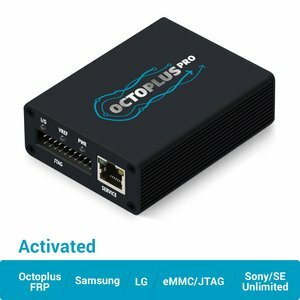 Thus, the user has been given the opportunity to participate in the development of Octoplus Pro and became known in certain circles. P.S. If you cannot find combination firmware for your model in “SAMSUNG/COMBINATION" folder in Support Area, this means we don’t have these files at the moment. As soon as we get new combination firmwares, we will upload them to the Support Area. Please note that Repair IMEI / Unlock procedures won't work for phones Sony Ericsson, which were manufactured after 12W10 (12W11, 12W12, 12W13 and later) (phones with so-called new security). There are no restrictions on Sony devices manufacturing date.